Don't you just love getting something in the mail besides bills and junk? 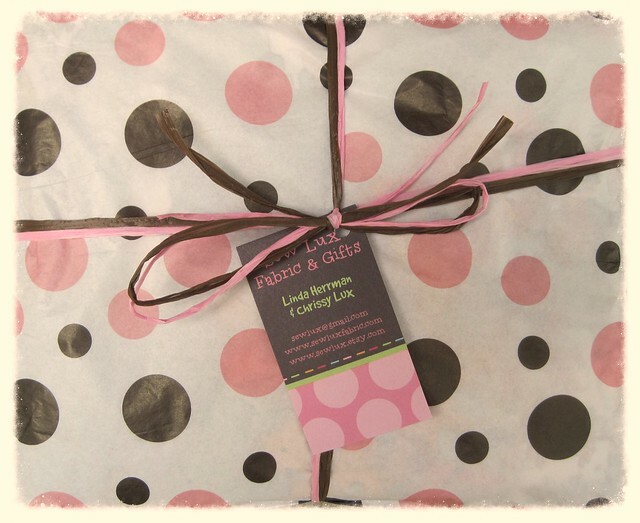 Today I received this beautifully wrapped package of fabric from the Sew Lux Fabric & Gifts shop. I've ordered fabric from Sew Lux before and am so impressed with the lovely way they wrap their packages. 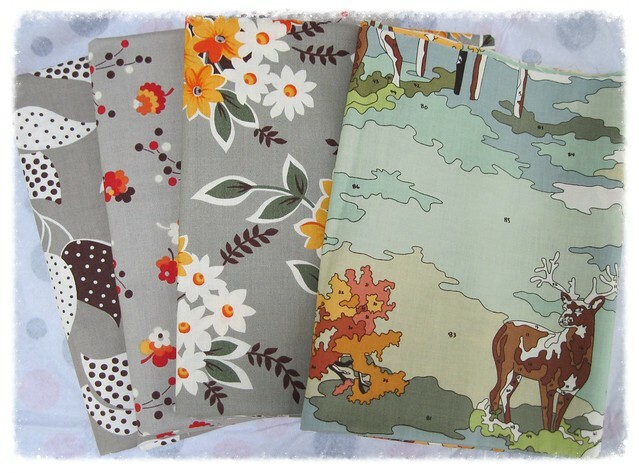 I'd say they go the extra mile to make you feel like the beautiful fabrics you ordered are really special! Wouldn't you? How about you? Do you have a project that has been just waiting for the right reason to pull it off the shelf and get started? I'd love to hear about it in the comments! Measuring progress & fun new swap! 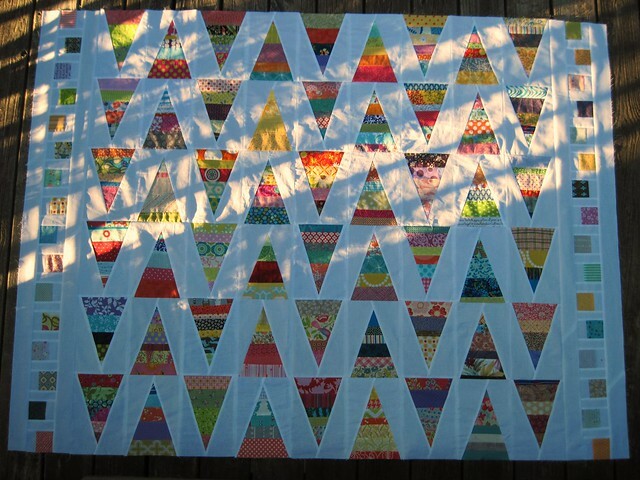 Little by little I'm making progress on the scrappy triangles quilt. I've had some requests to see a picture of the entire quilt back so here it is. It's quite bright and I hope cheerful! 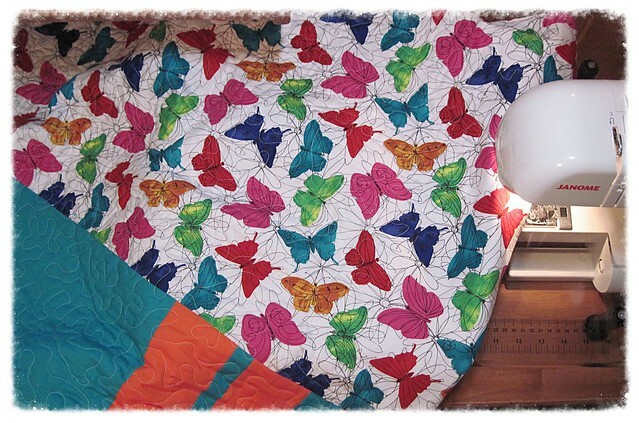 I bought the butterfly fabric because butterflies are the symbol for Restore Innocence. 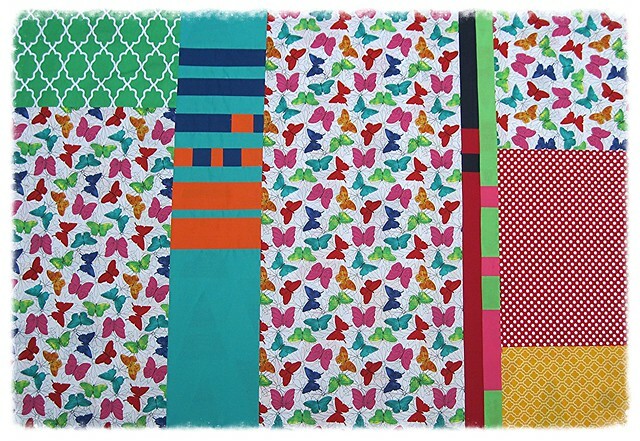 I knew I'd like to try my hand at some improve piecing so I bought 1.5 yards of the butterfly print and added additional fabrics from my stash. I'm hoping the finished product comes across as modern and fun. In case you are wondering I ended up using spray basting. It's just so quick! I had the backing, batting, and top laid out and basted up in about 30-40 minutes...so fast! 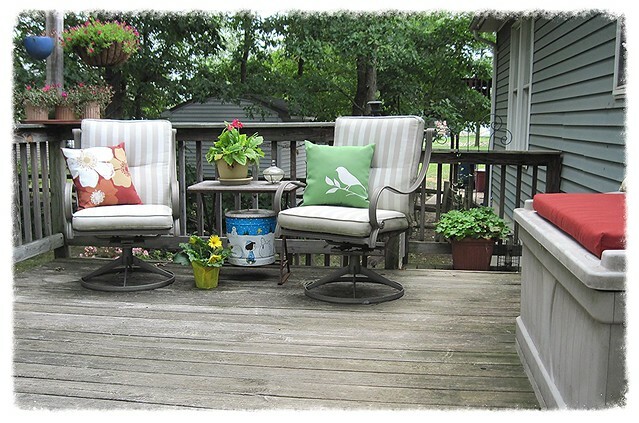 When the weather is nice I spray baste outside on our deck. I sweep it off well and then have a nice large area to work on. Before I started quilting I did a quick refresher on free motion quilting using a home machine since I've not done it in a while. I really like this great tutorial posted by Oh Fransson. 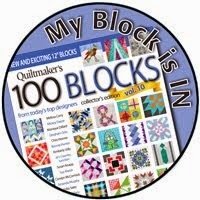 It's a learning process to quilt on my home machine. I have a Janome DC3018 sewing machine and I really like it. It's not one of the large Janome machines which makes it a bit of a challenge during the quilting process because the harp opening is quite small (just 4.5" x 6.5".) This causes a lot of "stuffing" when trying to move the quilt around while meandering/stippling. It's hard to post this close-up picture because the "oops" areas are glaring out at me. As you can see it's not perfect, but hopefully the young lady who receives this quilt will know it was made with love and that things in life are rarely perfect. 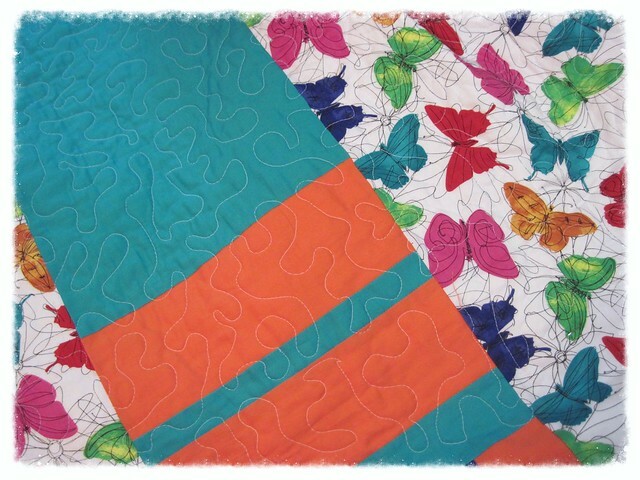 Just a few more quilting sessions and I should have this quilt all ready to bind! I'll leave you with this announcement...there's a fun new swap if you're interested! 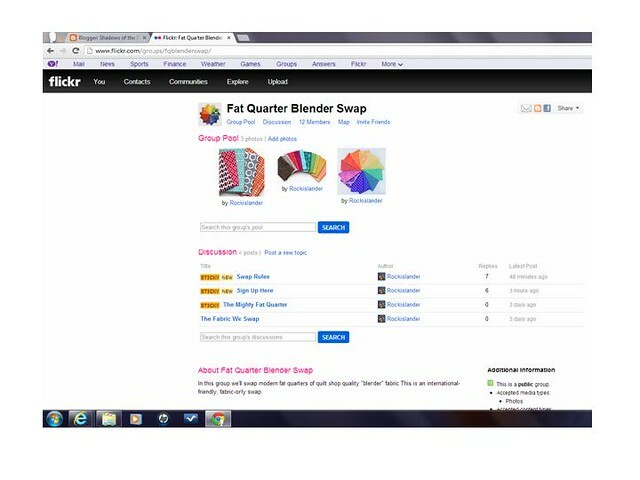 flickr member, Rockislander, is putting together a Fat Quarter Blender Swap. Requirements are basically to have a flickr account and agree to the swap rules. All of the details can be found here! 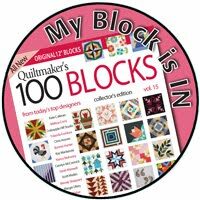 The sticking point for me on most quilts ends up being the quilt back. By the time I get to this point I'm just ready for the quilt to be finished. 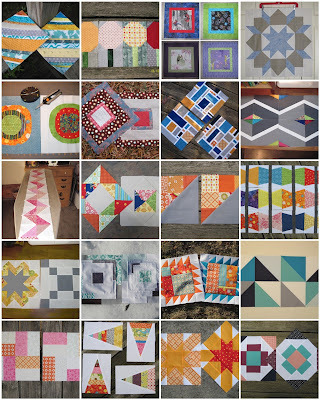 I often turn to the Quilt Backs flickr group to find inspiration. This is the back for a quilt I am making for the Faith Circle of do. Good Stitches. 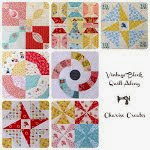 The front is called Scrappy Triangles. Each of the ladies in the Faith Circle made triangles using scraps from their fabric stash. 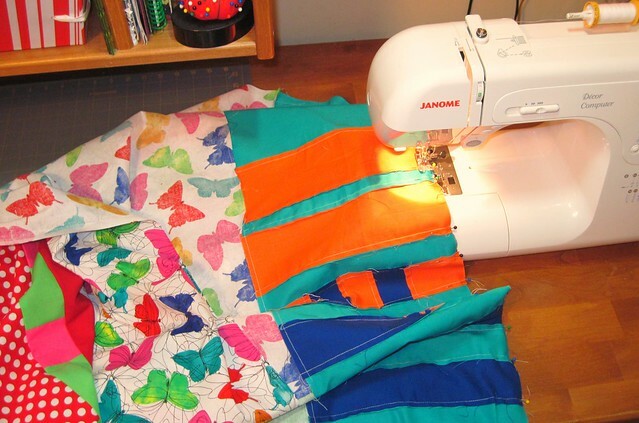 This quilt is a good way to put tiny fabric scraps to good use. 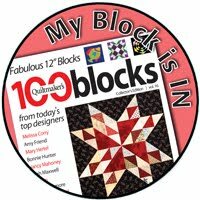 This fun block was designed by Ashley who blogs at Film in the Fridge. The tutorial can be found here. Next up is the basting process. I'm still mulling over pin basting or spray basting. I really like how securely the quilt is held together using spray, but at the same time it leads to a more "structured" feel when quilting. I've toying with idea of doing an all over stipple pattern. 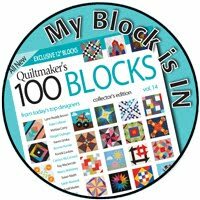 I've never done free motion quilting (FMQing) on a quilt this large and I'd kind of like to give it a try. If not, there is always straight lines...I like them, too! Here's a scripture verse to inspire me to finish this quilt...maybe it will inspire you, too! 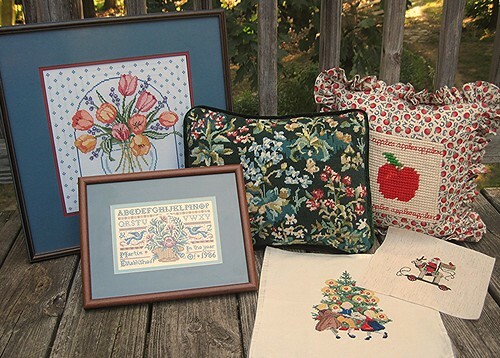 Next came years of cross stitch and needlepoint. Just like with my quilts I have projects in various stages of ever being finished. For a time the go-to wedding gift was a cross stitch sampler. I was so proud to make my mom the cross stitch tulips. I secretly worked on it while at college. Now that she is gone it has found it's way back to me. Then, combined with lots of gardening and computer work, my hands began to suffer fatigue. So, I pulled out my $99 Singer sewing machine and decided to try a log cabin quilt. With some help on fabric placement from a new neighbor I made my first quilt top (no picture, darn!) 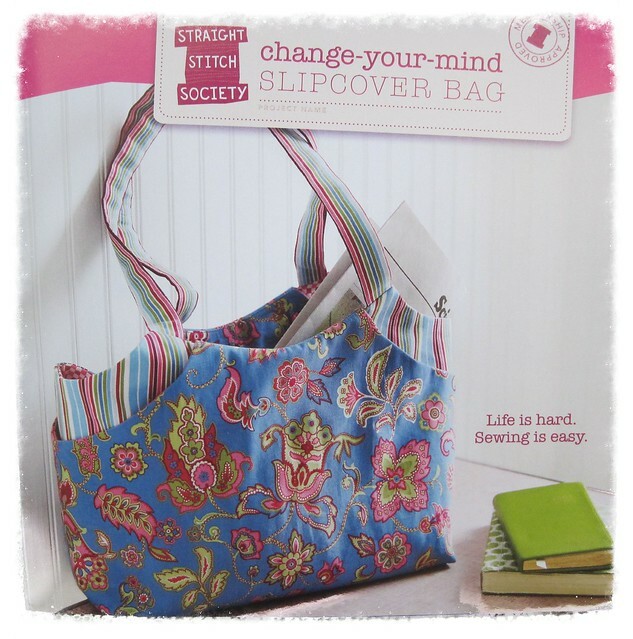 It was a Christmas present for a dear friend who I knew would graciously receive it - wonky sewing and all. Not having any idea how to quilt it I tied it with red yarn. 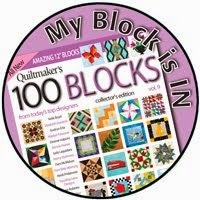 Fast forward about 15 years and I'm still quilting. 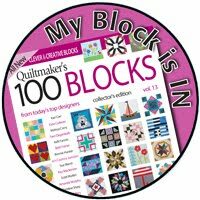 It was my desire that God could lead me to use quilting and sewing as a way to be His hands and feet in this world...even in very small ways. One way I've been blessed to be able to do this is through the Faith Circle of do. Good Stitches a virtual bee. 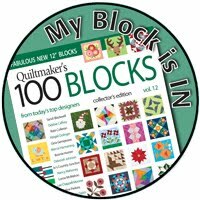 Through participation in this group I've been a part of 20 quilts so far. Initially the Faith Circle made quilts to meet needs found in our local churches. Earlier this year we adopted Restore Innocence as the recipient of our quilts. "Restore Innocence restores victims of child trafficking back to the innocent children God created them to be." -quote from the Restore Innocence Web site. do. Good Stitches is the brain-child of Rachel of Stitched in Color and I believe there are currently 19 circles - including international! Periodically, as members come and go, there are openings in the current circles. 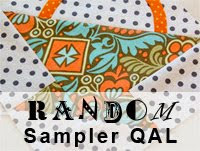 In addition, when there are enough quilters, Rachel will begin a new circle. If you are interested check out the information here. How does one begin a blog...exactly? Putting writing out there for people to read. Already knowing that correct punctuation and sentence structure have never been a strong area. Maybe that doesn't matter in the grand scheme of things...maybe blog readers are gracious, kind people who know the risks writers take when sharing thoughts and ideas. Since I often wonder how blog names are selected I'll share my reasoning. 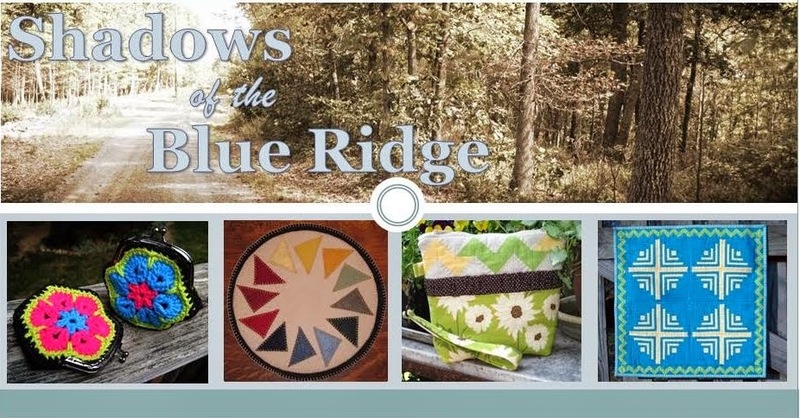 Most of my life I've lived in the shadows of the Blue Ridge Mountains. Old, strong, beautiful mountains that have witnessed much in the passing of time. They bring a calming peace to the landscape. In my younger years I lived just east of these mountains, now I live just west of them. In the endless possibilities of life I find mountains to be a visual reminder to limit the focus. We are fortunate to own a little part of a mountains range in the Appalachians. This range runs parallel to the Blue Ridge. 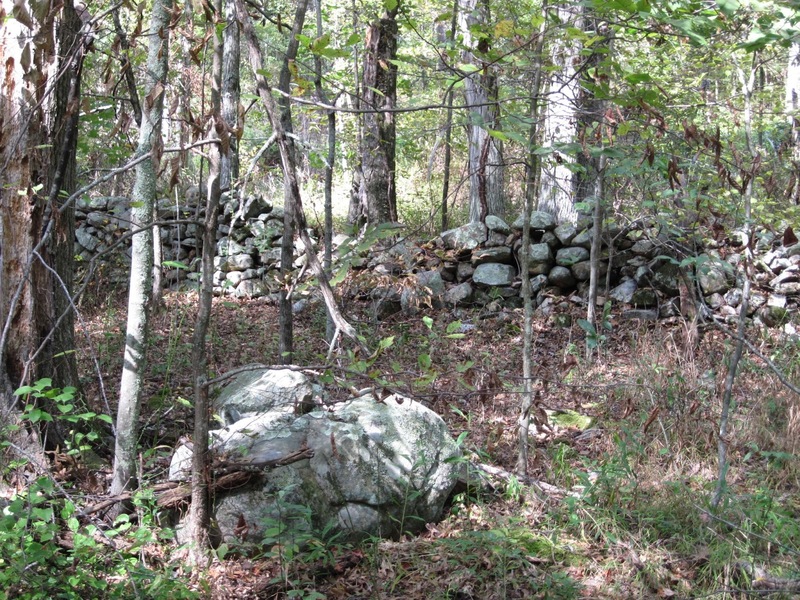 Our land has three old roads running across it and also three runs of stone. The one in this photo is truly a wall. It makes me wonder who built it and when? Someday we plan to live here, and I plan to quilt here...someday.